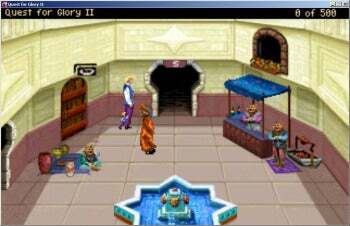 Retro-style adventure in Quest for Glory II: You can buy the city map here, but you need to find a moneychanger first. In the wake of DoubleFine's "Adventure Game" Kickstarter success and the flood of projects it inspired, adventure games have become the latest cause célèbre of the indie community. It's a welcome change from the twenty years of cruel obscurity the genre suffered at the hands of action franchises, but in truth, good adventure games are difficult to make, and there are precious few of them. Nostalgia often renders a kinder judgment on games like King's Quest than its occasionally tedious mechanics deserve. The few games worthy of classic status from those early days earned their reputations largely on the basis of quality artwork and clever writing, rather than gameplay innovation. Sierra's Quest for Glory games bucked that trend, providing new twists for players with the standout being the second title of the series, Trial by Fire. AGD Interactive has rescued this fading star from obscurity with a slick remake, keeping the golden age experience intact while elevating the visuals and user interface to relevancy once again. Things are looking grim for our hero. 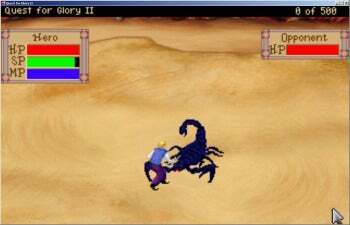 Chief among Quest for Glory's many charms is the inclusion of an actual, real-time combat system. Complete with special attacks, critical hits, missile weapons, blocks, spells and more, players can choose from over a dozen maneuvers when facing off against the diverse enemies Trial by Fire tosses their way. Virtually unknown in adventure games even today, this mechanic gives meaning to the hollow, static combat victories so common in other adventure titles. If you want to be victorious, you're going to have to swing, zap and dodge your way through an actual fight. Don't worry, a pause feature, difficult sliders and combat assistance are available for the action-impaired, and they don't sap the fun out of the proceedings. Elimination of the text parser means you can click your way through conversation. Outside combat, QfG: TbF's environmental interaction is accomplished via the traditional point and click method, with the right mouse button cycling through various basic actions such as examine, manipulate, move and speak. These are also available via a pop-up menu at the top of the screen, where you’ll also find more esoteric options such as sleep, magic and stealth movement. The game comes across as a hybrid adventure/RPG, as you have a sheet full of stats that increase, an inventory with items you equip and upgrade, and other familiar roleplay trappings. 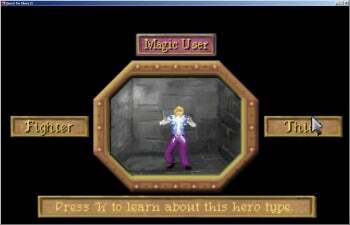 There are even three character classes to select from on the opening screen. The upscaled and filtered VGA artwork retains the original Quest for Glory's nostalgic character and charm." 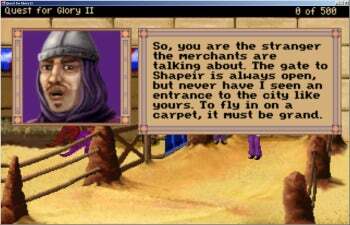 Quest for Glory II is a particularly good pick for a remake since the original was Sierra's last EGA adventure game. While newer titles forged onward with 8-bit, 256-color graphics, and the original entry So You Want To Be a Hero received a VGA makeover for mid-1990's anthology packs, Trial by Fire was left behind with 4-bit, 16-color artwork and other design compromises dictated by the primitive hardware of its day. AGDI addresses this in fine fashion with lovingly recreated full VGA backdrops, fresh music, and new backstory content left out of the original due to space and time constraints. Antialiasing and scaling routines allow the game to run at resolutions up to 1280x800, although you shouldn't expect native pixel resolutions at those sizes, just smoothly scaled and filtered versions of the remade VGA screens. AGDI has also made the typed-text parser command system optional, so you can play the game mouse-only. There is even an optional streamlined version of the maze-like city sections that frustrated players in years past, although the best way to avoid navigation problems is remembering to get a map at the city gate when you start. Puzzles and opponents are tackled with different tools, depending on class selection. This project was a decade-long labor of love for AGD Interactive, and it shows. The result of that hard work is a hand-polished classic you should be embarrassed to download for free. While all of their remakes are a pleasure to play, Trial by Fire is something special. Give it a go; that indie gaming pack you got on sale at Steam can wait. Return to the heyday of adventure games with the updated Quest for Glory II: Trial by Fire, which wears its age with pride.